Changers SaaS occupational health platform is live. Thank you dear Changers development team. You did great. 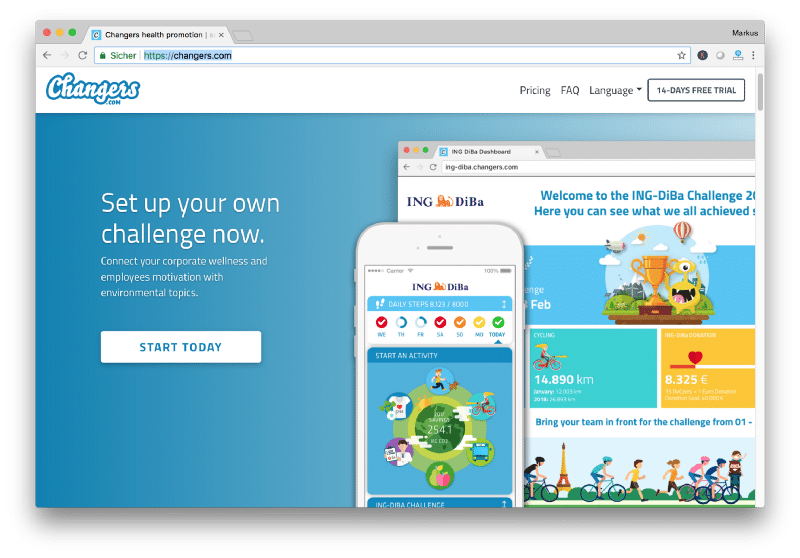 From now on, our entire application, the apps for Apple iOS and Android, as well as our Global Corporate Challenge website will be available on the web as a SaaS platform. Companies can sign up via the web and configure the Changers CO2 fit app themselves. Playful competitions between branches, departments or freely chosen teams can be arranged and the participation can be combined with tree planting, donation projects and valuable bonuses. And all at prices of just a few cents per participant. Without setup fees and contract terms. Changers.com – good for employees and good for our climate. PreviousCorporate health promotion also means taking responsibility.